Welcome to my book of middling level tunes for harp. As in my earlier book Fires at Midnight, I suggest you listen to the accompanying CD at your leisure and absorb the music before trying to play. There are differing styles and chord types here plus some chord charts so feel free to make your own shapes and arrangement. I am very grateful to the composers Andy Thorburn, Phil Cunningham and Ivan Drever for letting me arrange their beautiful tunes. Do check out their own recordings and make more music! Welcome! Please listen to the accompanying CD as often as possible before you try to learn these tunes. This will let the shapes and patterns of the melodies and chords settle in your brain before you attempt the hard bit of transferring them to your own fingers. Take it slow and steady with building up the arrangements – perhaps a right hand first or chord pattern as I have done on the recording. Use the CD again to play along to or to accompany yourself – karaoke clarsach! With this selection of traditional and new pieces, I`ve used a range of styles and feel. I hope you find something you really like the sound of and will play for a long time to come. Music book with accompanying CD. Level elementary. This collection of 13 traditional and composed tunes has been arranged to encourage the learner to play along with the CD slowly while having the dots to refer to, so gaining confidence and fluidity in their playing. The first book in a planned series, it will be of interest both to those just starting out on the harping trail and to players a little further down the line wishing to expand their accompaniment styles. Music Book. Level elementary to advanced. This collection of 12 instrumentals and 2 songs ranges from Wendy's popular waltz 'Fires at Midnight' and beautiful composition ‘Cairn Water’ to sets of jigs and reels. Many of the arrangements have simplified versions and chord symbols which makes then accessible to the more elementary player. All the pieces are featured on the CD Standing Wave. Wendy Stewart's second book of traditional and own compositions for the small harp. "About Time Too!" contains many tunes requested from her albums, such as 'Drummond Castle', 'Macleod of Mull', 'Roslin Castle', 'Dances with Friends', and is a follow on from her previous very successful book "About Time". 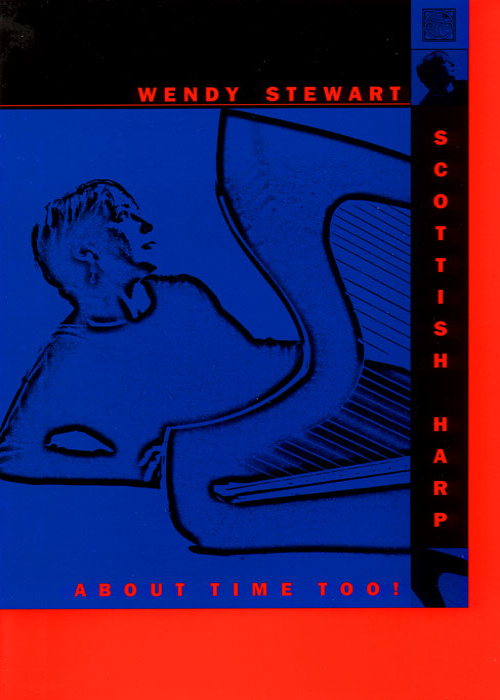 A lively collection of Scottish tunes and others for small harp (or piano) arranged by Wendy. Includes pipe marches, slow airs, mazurkas and 'jazzy' pieces.